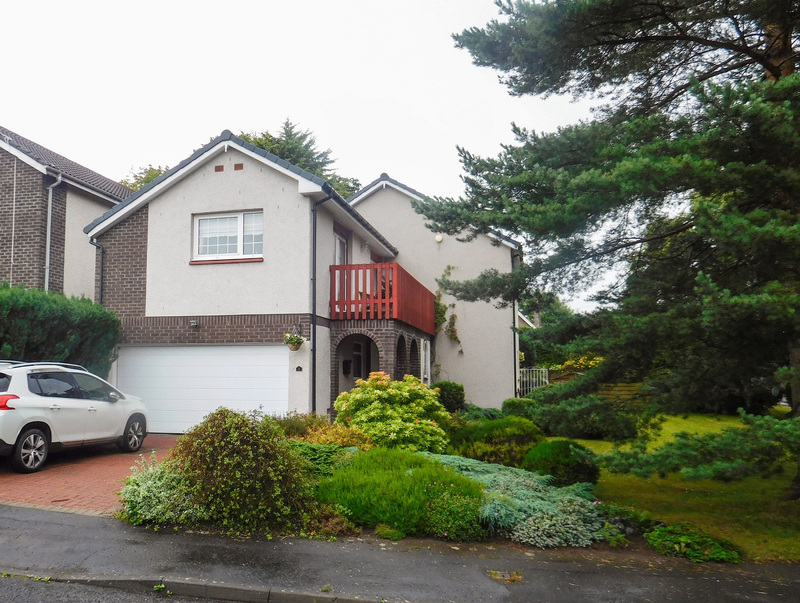 This exceptionally spacious detached villa is located within a quiet crescent of similar style homes within the sought after West End of Dundee. The accommodation comprises on ground floor level, entrance vestibule/cloakroom with glazed French doors leading into an attractive hallway with two large storage cupboards and access to all downstairs accommodation including w.c. with carpeted stairway which leads to the upper level of the property. The generous sized lounge has large picture windows overlooking the gardens which gives plenty of natural light into the room, traditional fire surround with coal-effect gas fire and feature light fittings. There are sliding glass paneled double doors connecting into the dining room with parquet flooring and feature lighting, again with large picture windows allowing natural daylight into the room. The Dining kitchen is located from the hallway and dining room and is fitted with a wide range of base, wall and drawer units and co-ordinating worktops, tiled flooring, integral double oven and extractor hood, fridge, dishwasher and inset lighting. Carpeted stairway leads to the upper level and gives access to the spacious upper sitting room with glazed double doors leading out onto the balcony which overlooks the gardens below and provides views over the Tay Estuary. There are three good sized double bedrooms one of which houses the en-suite shower room with w.h.b and w.c. There is further access onto the balcony via glazed patio doors from the Master bedroom. The family bathroom is also located on this level with tiling to dado level, white three-piece suite and separate shower cubicle. The attic hatch is located on this level with access to large attic storage area. Set within a generous plot, the garden grounds are well maintained and laid out mainly in lawn with a variety of mature trees, plants and shrubs. A patio area to rear of the property and integral double garage with electric door access. Located in a highly desirable residential area in the West End of the City, the property is convenient for all local amenities and services including Perth Road shops, schools and public transport. Ninewells Hospital and Dundee University are only a short distance away and the dual carriageway is within a short drive, affording easy commuting to Perth, Aberdeen and beyond.